When browsing for the perfect greeting card in your local gift shop, there’s a multitude of options perched on the shelves. Whether you want to convey devotion to a loved one, admiration for a friend, or loyalty to a family member, there are countless ways of expressing personal sentiment. While the cards splashed on display stands are certainly colorful and fun, they’re also one in thousands (or millions), as cards from a shop tend to be mass produced for sale. With the Greeting Card Template made explicitly for Microsoft, however, your “greeting” or sentiment towards a loved one or friend can be expressed in a completely customizable and personalized way. The Greeting Card Template is undoubtedly cost-effective. The download from MyExcelTemplates.com is completely FREE for all users to acquire. The Greeting Card Template is 100% interchangeable and able to be personally customized. Although the template comes with a pre-made color scheme and format, the Greeting Card Template is contained within Microsoft Word, capable of being edited and personalized to fit your specific needs. 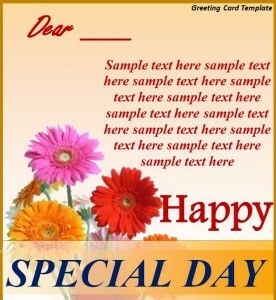 The Greeting Card Template can be reproduced efficiently and quickly. Looking to send out multiple greeting cards during the holiday season? The Greeting Card Template is easily reproduced, capable of being scanned, copied or re-printed from your home computer. Although most greeting cards only contain enough space for a few sentences or paragraphs at most, deciding what words to fill empty paper lines with can be somewhat frustrating. More often than not, writing a greeting card requires a deeper kind of thought, especially when referencing a person, place or time that is truly dear to the heart. Always consider the reasons you have for expressing your sentiment towards a loved one. Are you trying to convey love, affection, loyalty or admiration? Or, are you simply wishing to elicit a smile from your receiver? No matter what the goal you have with the greeting card template, always keep in mind that the least amount of wording tends to work best. Looking to download a customized birthday, wedding or postcard? Be sure to explore our large inventory of card templates for word.